Modern and Elegant Design: The modern and elegant hood design provides the operator with excellent visibility and enables quick and convenient access for daily maintenance. CRDI Diesel Engine with Daedong ECO Technology: The new Common Rail Diesel Engine (CRDI) improves fuel efficiency while at the same time having less noise. With this eco-friendly Tier 4 engine, the RX Series offers the operator a quiet work environment with smooth and powerful performance. Power Shuttle Transmission: The power shuttle transmission provides smooth and easy shifting on the move. The transmission features 12 forward and 12 reverse gears to handle anything. The Power Shuttle Lever provides easy forward and reverse operation without stepping on a clutch pedal. Turn Assist Control: The optional Turn Assist Control kit will drop the engine rpm by 10% automatically when turning sharply. This feature allows for more precise work and reduces fuel consumption during sharp turns. Projection Head and Working Lamp: With the new projection head and working lamp, the operator will experience safer and easier operation after the sun goes down. Deluxe Suspension Seat: The luxurious and adjustable seat is standard for the RX Series. The ergonomic, suspension seat allows the operator to ride comfortably, no matter what the job may be. A pocket on the back of the seat allows easy access for the operator's manual. External Hydraulic Lift Cylinder: The RX Series tractor has two external hydraulic lift cylinders which makes maintenance easier and increases lift capacity up to 3,898 lbs. (1,768 kg). Remote Hydraulic Valves and Joystick: Standard single lever joystick and mid-mount hydraulics are valuable for front implement. Standard single remote valve (2nd and 3rd optional) accommodate a wide variety of attachments and implements. Large Capacity Fuel Tank: The 25 gallon fuel tank allows productive working hours without the need for frequent re-fueling. The warning feature includes fuel warning indicator lamp in the instrument panel and a buzzer to help prevent accidentally running out of fuel. Power Steering: The standard power steering minimizes the effort required to make tight, repetitive turns. The steering wheel tilts with the simple push of a lever, allowing easy adjustment to fit the operator needs. Push Button 4WD: The 4WD is engaged with the simple push of a button. The Auto 4WD engagement allows for increased brake performance. Front End Loaders : KL7320: Fits the RX6620/7320 models. 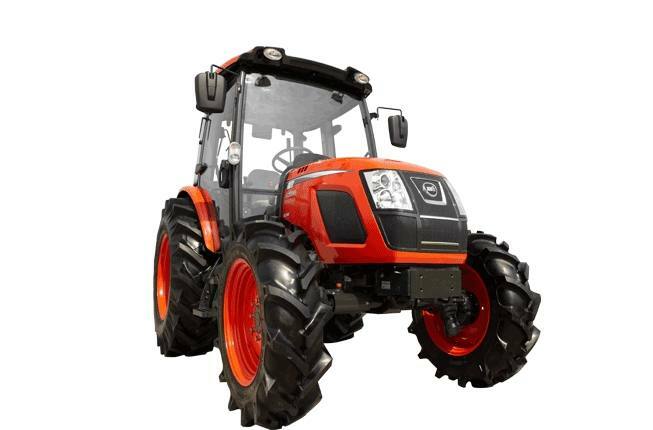 The KIOTI KL7320 front end loader is specifically designed for the RX6620/7320 model tractors, providing efficient performance with single lever joystick control. The KIOTI loader, with a built-in parking stand, is designed to be quickly and easily attached and detached. KL Series loaders utilize the tractor's hydraulic system, feature single-lever control with float and come with a bucket level indicator. *Specifications may vary with tractor model, front axle configurations, tire size option and type of attachment and are subject to change without notification.